As the world economy began slowing down, some call centers began downsizing or putting a freeze on hiring. However, most call centers did not see a reduction in client contacts. 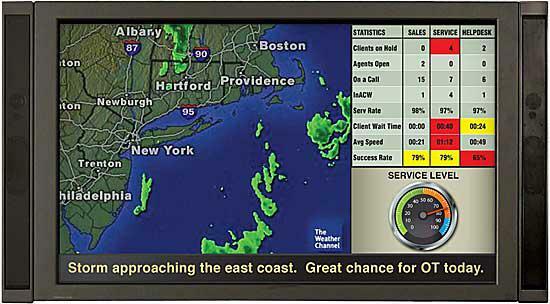 In fact, many call centers Spectrum works with has seen an increase in contacts. Many of these contacts are negative ones such as calls to complain or cancel an order. Call Center managers are tasked with having fewer agents to work with and rising contact volumes. This challenging situation has created a negative attitude in many call centers. High call volumes; more difficult clients than the norm; more clients cancelling orders, policies or coverage; lower sales (read commissions and bonuses); and internal pressure from company management to increase sales, improve customer satisfaction and first contact resolution have all led to a more negative overall call center attitude. To help combat the negative attitude and improve call centre morale, call center managers have been doing much more positive messaging than ever before. This goes beyond the typical generic group message of "Great Job Today". Today managers are pointing to specific agents that have done an outstanding job and are congratulating them on the LCD screens as well as on their desk tops. 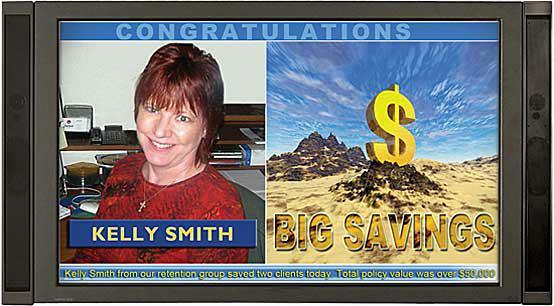 The messages are more detailed such as "Kelly Smith, from our retention group saved two clients today. Total policy value was over $50,000." This type of message puts a face with the message, acknowledges the agent and shows the call center the company cares about the agents. Figure 2: Positive Messaging improves morale in the call center. Figure 3: A positive message directed at a specific agent from Senior Management. 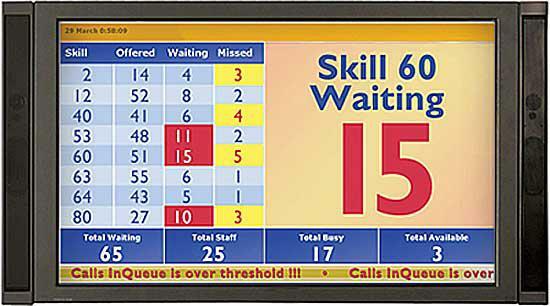 Another area where positive messaging is occurring is in the way KPI's and Metrics are being displayed. Today many KPI's and Metrics point out the negative or the bad statistics such as a low service level number highlighted in bright red for all to see or abandonment rate with high percentages. Rather than focus on the negative, companies are focusing on the positive side of KPI's and Metrics. Abandonment Rate (AR%) is now called Service Rate (SR%). 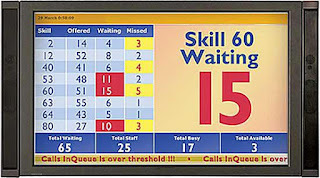 So instead of showing a 4% AR, companies are showing 96% SR. Calls in Queue (CIQ) is now Customers on Hold (COH). Calls for the Day (ACD) is now Satisfied Customers for the Day (SCD). These few examples are actual contact centre examples. While these may seem trivial the results at these call centres has been a more positive attitude as well as happier agents. Positive messaging and changing the KPI's and Metrics have been proven to improve the overall morale and attitude in the call center. Contact Spectrum today for examples of positive messaging and changing your KPI's and Metrics.